Personal resolutions like lose weight, quit smoking, spend more time with family, etc. are great ways to kick off the new year. But as we grow ever closer to February, the motivation to continue our new year’s resolutions is fading quick. 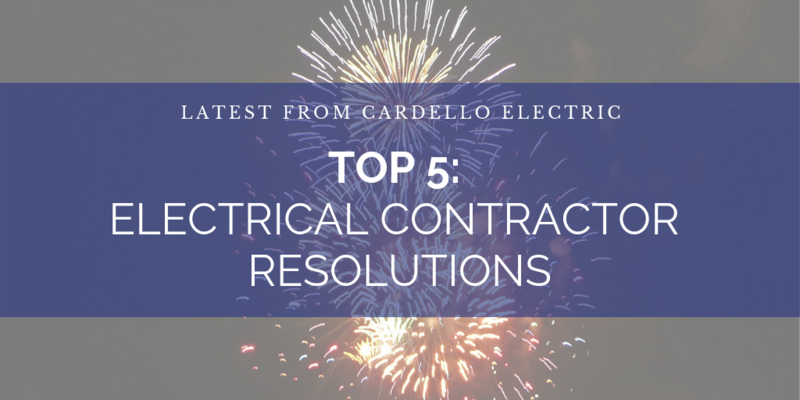 For small business owners like electrical contractors, making and sticking to your business resolutions can mean the difference between a successful 2019 and “well, there’s always next year.” Read on to discover our top picks for great & attainable resolutions for 2019. Workplace accidents can cause major setbacks to your business. Take the time to review your safety procedures as well as any federal and local safety standards and make changes as necessary. Go over all policies with your employees, revisiting current items as well as any new implementations you’ll be making this year. Keep dialog open with bimonthly safety meetings to help keep your risk minimized. Technology is ever changing. With new and improved products constantly coming out, it’s important to stay connected with industry trends. Valuable resources such as websites (EC Mag, EC&M & Electrical News), industry organizations (NECA, The Electric League, IAEI) as well as your local Cardello Electric Counter all offer lots of tips, tools, and information. Check out Feedly to capture the latest news from your favorite outlets into one (or more) feed! Word of mouth marketing is GREAT! It’s free, it’s trusted, but it’s not going to be enough. Consider a Google My Business account (see our article here) or a Facebook page to start. Both these items are also free and require a minimal amount of time, consistently. Brain storm other options for getting your name out there: direct mail pieces, colorful brochures, ads in your community magazine, etc. Websites are a great way to give your business a professional appearance and sites like Wix are making it easier than ever before to get started! Your employees may have some great insight into what & how you can improve your business. Ask a few key members of your staff what problems they run into at the jobsite, what their thoughts are policies and procedures as well as their views on daily operations. There could be some really valuable insight right under your nose! You work hard, non-stop even. Long hours doing work that is both physically & mentally draining takes its toll, so make sure you reserve time just for you & your family. Whether it’s restricting phone usage, setting “office hours”, or getting away for a few days here and there, make sure you take the time to decompress. It will help to reduce stress and anxiety while boosting productivity. Keep this practice in mind for your employees as well!